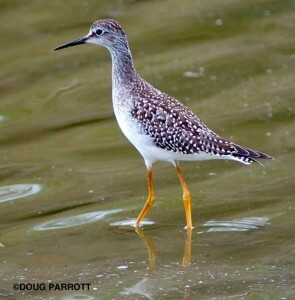 Birders are always happy to see a yellowlegs ­– a long-legged shorebird decked out in spring in harlequin black-and-white. But birders rarely go into much detail when we talk about them. 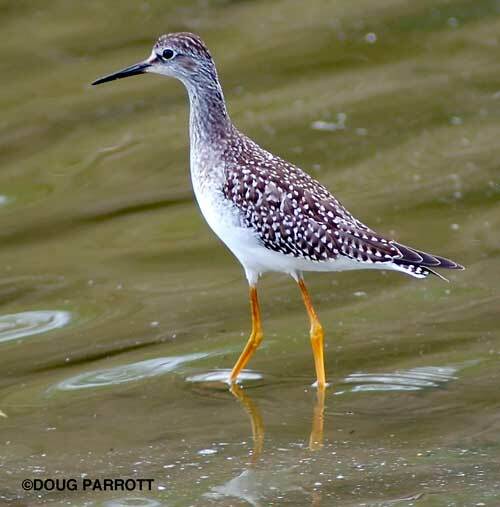 We’ll say, “I saw a yellowlegs today,” and let it go at that, although there are two kinds of yellowlegs: Greater and Lesser. The reason we don’t specify is that it’s very very hard to tell these two species apart. One is a little bigger than the other (the Greater), has a slightly upturned beak, and knobbier knees. But it can be difficult to see these distinctions in the field. Much safer to stick to the generic. My husband calls all these birds “eyebrow birds,” because the differences come down to what in humans might be only a couple of eyebrow hairs. John dislikes eyebrow birds. Give him a flamingo or an eagle, and he’s a happy birder (although, come to think of it, it ain’t all that easy to tell flamingo or eagle species apart either!). Greater or Lesser? You tell me! I, on the other hand, love these inconspicuous differences. They set me a puzzle that I like to solve. They force me to really look at the birds, when it can be way too easy to give them a quick scan and hurry on down the human road of too many other things to do. They give me something to wonder about: how important are these differences to the birds; do they mark recent speciation or are they long-standing; what evolutionary forces are at work to make species different yet superficially similar? In other words, these small differences make me notice the natural world and marvel. Yellowlegs are coming through the Fill right now. If you are lucky enough to see one, I hope you stop a moment and try to figure out which kind you’ve got. You’ll smile for the rest of the day. This entry was posted in Uncategorized on April 14, 2010 by constancesidles.